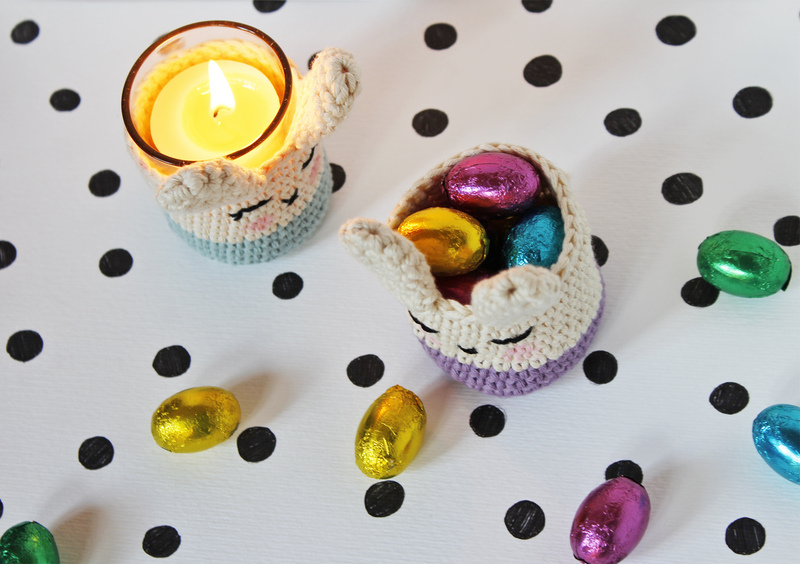 Guest Post – Easter bunny candle holder! I’m Maria Elisa from Needles and Skeins and you are probably wondering what am I doing here, on BettaKnit’s blog…sometimes you will see me as a guest of these virtual pages actually, because this is the first in a series of Guest Posts about crochet! Sometimes I will publish a free pattern with a step by step tutorial to realize them, other times we will review some crochet stitches or basic technique. 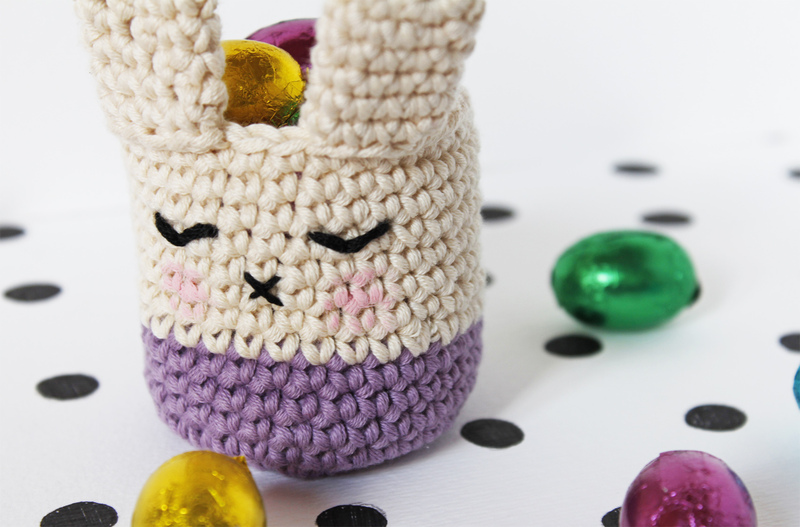 If you already visited my blog you should have noticed my passion for animal shaped projects…so when girls from BettaKnit asked me to create a pattern for Easter, I was immediately inspired by one of the animals symbol of this holiday: the Easter bunny. 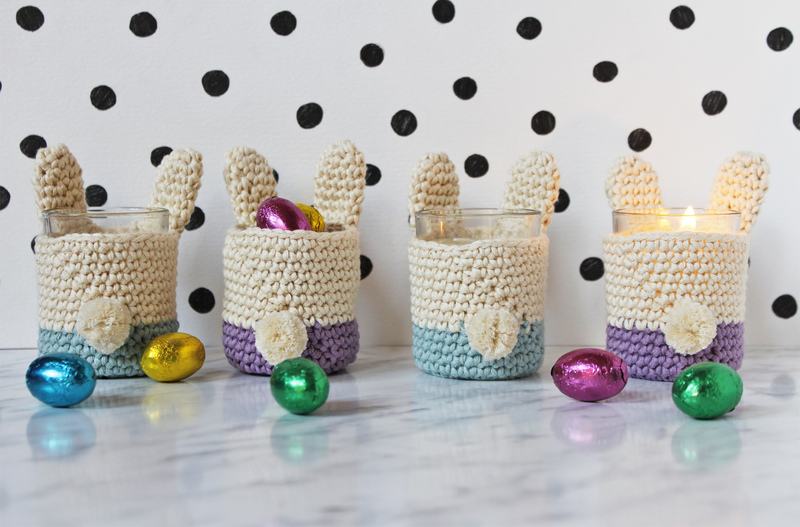 Here you can find the pattern and a step by step tutorial to make some adorable and funny Easter bunny candle holders! These are small baskets made with soft and bright cotton, which surround glass candle holders. They will cheer up your home or your Easter table with their expressions, funny and lovey-dovey at the same time. 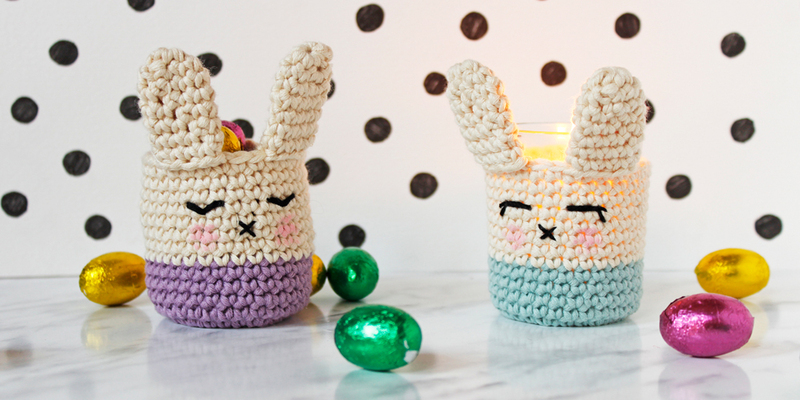 If you can’t find the glass candle holders you may fill the bunnies with chocolate eggs and use them as place cards, especially if they are realized in many different colors! They could also become an original present for your guests, replacing the more common Easter egg. Pima Cotton is perfect for this project: it’s soft, easy to be worked and available in many colors. So let’s move to the pattern! 1 skein of “Pima Cotton” yarn in vanilla, you can find it here! 4 mm hook, you can find Bettaknit’s here! Round 1 – 8 dc in the magic ring with the colored yarn ( the one in the pic. 1 is the mint yarn), then sl st in the first dc. Round 2 – 1 ch, then 1 inc in each stitch around [16 dc], sl st in the first dc. Round 3 – 1 ch, (dc in next stitch, inc in next stitch), repeat 7 times [24 dc]. sl st in the first dc. Round 4 – 1 ch, (dc in next 3 stitches, inc in next stitch), repeat 5 times [30 dc], sl st in the first dc. Round 9/16 – 1 ch, dc in each stitch around [30 dc]. sl st in the first dc. Cut the yarn and hide it in the work with a yarn needle. Round 1 – 6 dc in the magic ring with the vanilla yarn, then sl st in the first dc. (pic. 3). Round 2 – 1 ch, (dc in next stitch, inc in next stitch), repeat 2 times [9 dc]. sl st in the first dc. Round 3/7 – 1 ch, dc in each stitch around [9 dc]. sl st in the first dc. At the end of round 7 cut the yarn leaving the thread long (pic 4). – ATTACH THE EARS: Attach the ears to the body with a yarn needle, using the exceeding thread (pic. 5). – EMBROIDER THE FACE: Use the black thread to embroider the face. Make two little lines for the eyes and a X for the mouth (pic. 6). Make sure to fasten the thread on the inside, even with some knots if you are not expert! – COLOR THE CHEEKS: Dab the pink color under the eyes with a cotton bud, to make the cheeks. Use small amounts of color a time, blending it from inside to outside with circular movements. (pic. 7). Pay attention: some colors for fabric need to be fixed! Cover the area with a cloth and iron gently. 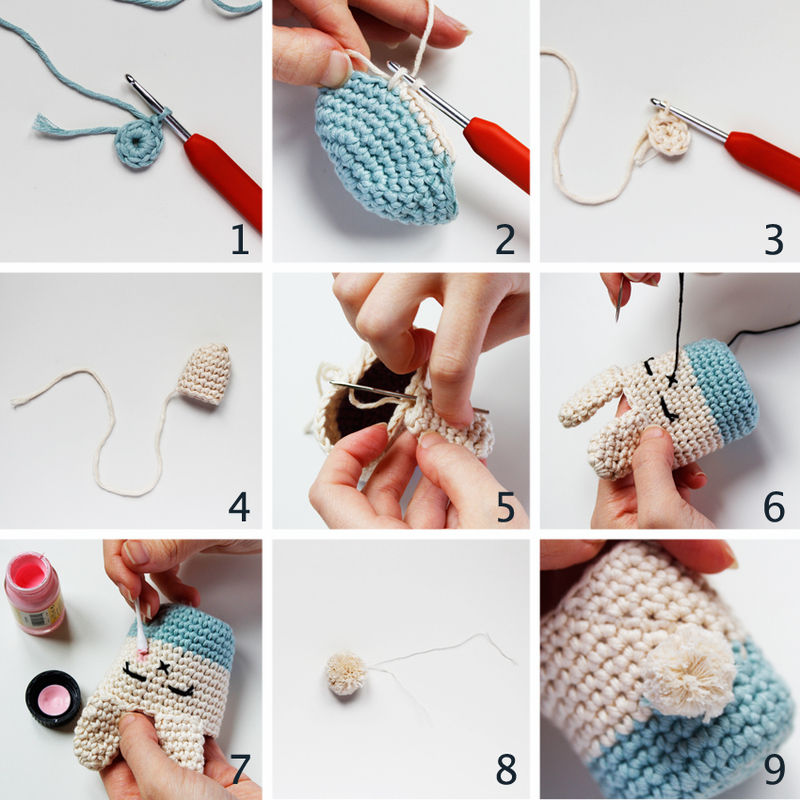 – MAKE THE TAIL (OPTIONAL): Make some tiny pompom using vanilla yarn, leaving the threads long (pic. 8). Use these threads to attach the pompom to the body, making a knot in the inside (pic. 9). Help yourselves with a yarn needle to insert the threads into the stitches. Let’s make a lot of bunny candle holders for Easter! And have fun embroidering new funny faces, all different! I want to see them, I’m really curious! 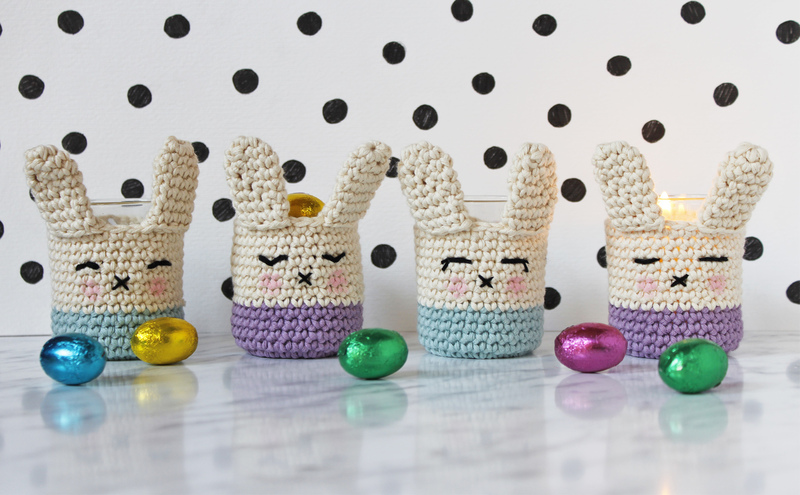 Take a picture of your Easter bunnies army and share it on Facebook, Instagram and Twitter using the hashtags #needlesandskeins #bettaknit #ilovebettaknit!